Embodied by yellow-green hellebores tinted in red violet the palette for today’s flowers covers my favorite half the color wheel. 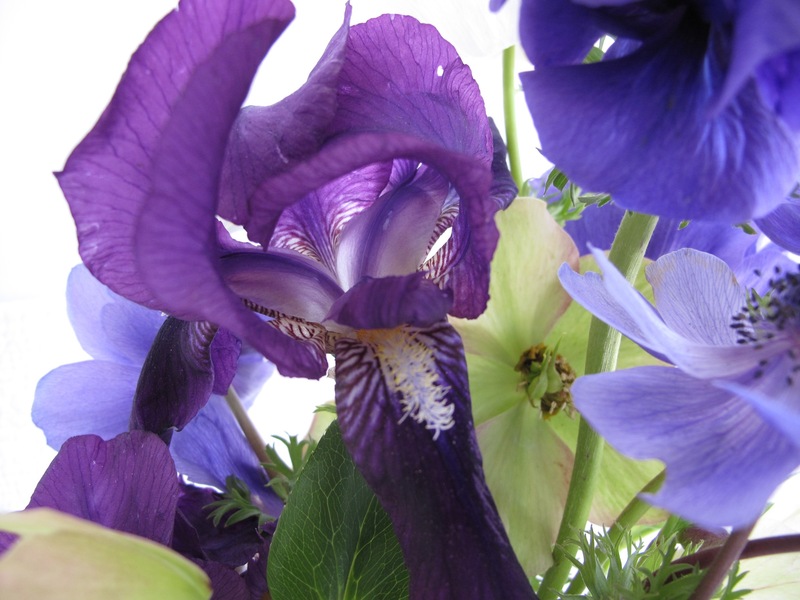 Reddish-purple bearded iris, violet blue anemone and a lime green container supplement the scheme. 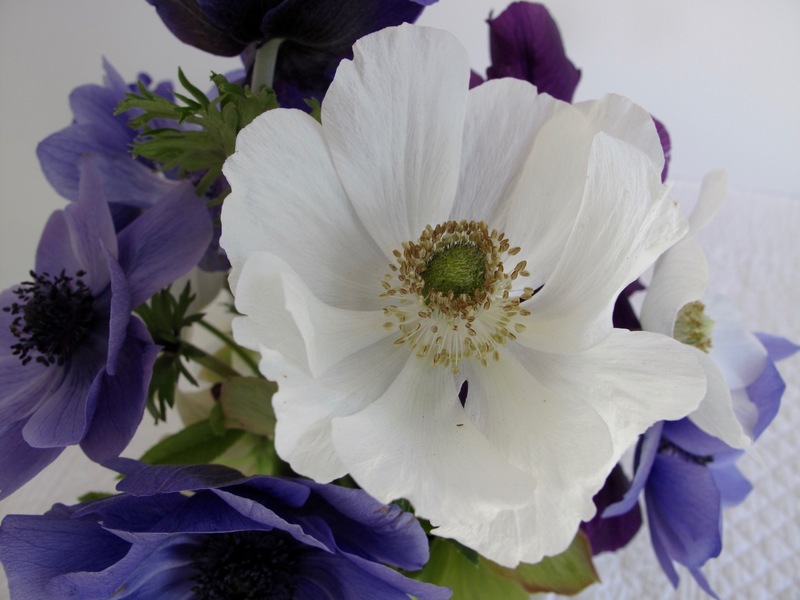 Several white Anemone coronaria ‘Bride’ offer a restful element. Included last week as well, the reddish purple bearded iris has been blooming just over a week in the garden. It is lightly scented. Prolific Anemone coronaria ‘Mr. Fokker’ continues to thrill. 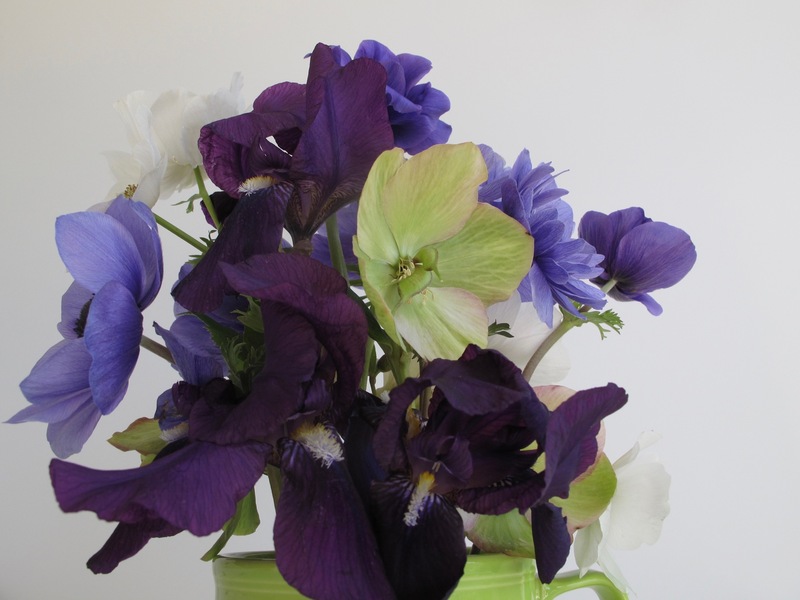 Newly opened flowers are richly hued, while older one fade to a lovely lavender. It is always best to work with the correct container from the beginning. This design feels slightly too tall and not wide enough for the substituted mug, making it seem out of proportion. I began this arrangement with another vase in mind, but it turned out to be too small. 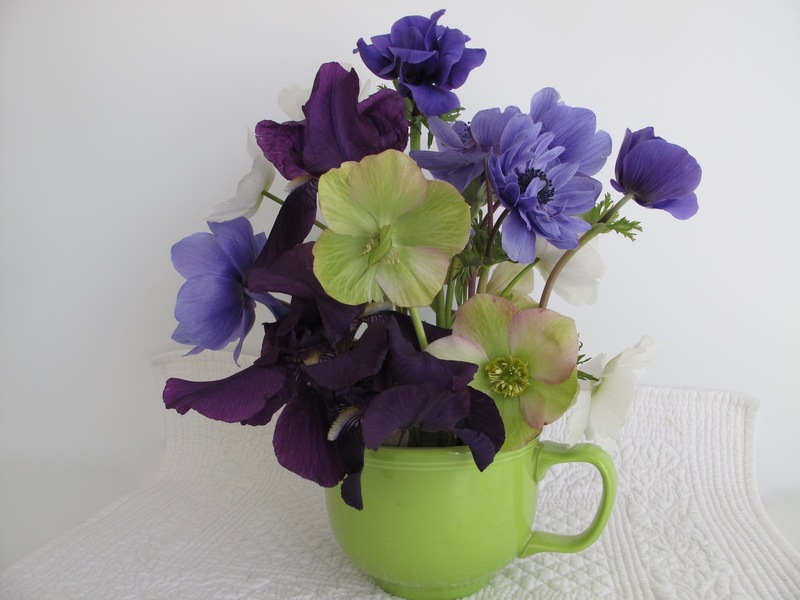 Although it did not work out as planned, the mug’s color picks up the green of the hellebore nicely and gives a nice overall pop to the design. These are not the only colors in my spring garden but if I had to I could be happy with this palette. Thanks to Cathy for hosting this weekly flower addiction. Visit her at Rambling In The Garden to discover what she and other gardeners are placing In A Vase On Monday. 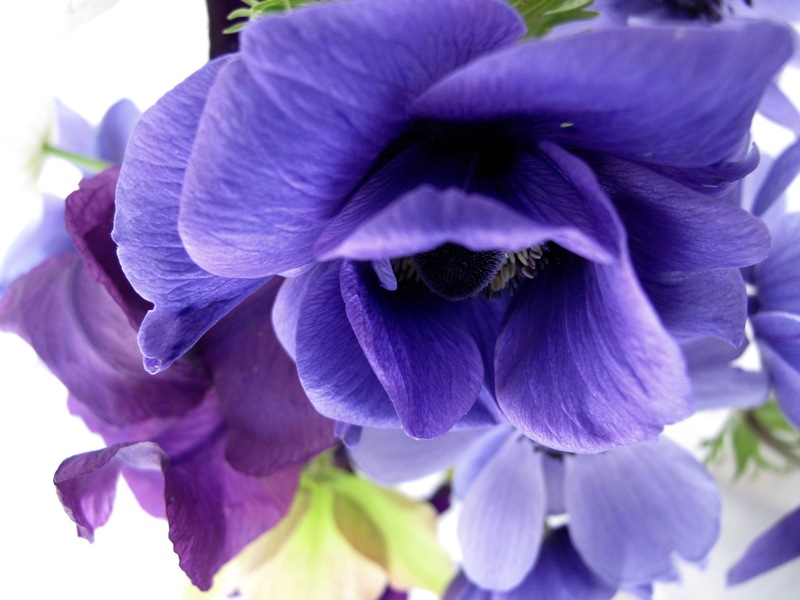 This entry was posted in garden and tagged Anemone coronaria, Bearded Iris, flower arranging, flower design, Helleborus x hybridus (Lenten rose), in a vase on monday, nature photography on April 18, 2016 by pbmgarden. Green and blue – simply perfect, Susie : ) Happy Monday! Thanks Annette. Have a nice week. Beautiful colors and so nicely combined. Very fresh and happy! Thanks Marian. At the recent flower show I heard several times it was a good idea to group flowers of the same type, rather than dispersing them individually, for more impact. I think it helped in this case. You’re right Judy, not often used in textiles. I think these colors would make a fine quilt. Thanks John. Must say I’m enjoying them in the house today. I love the colour scheme in this arrangement, Susie. It would be lovely as a planting scheme in the garden. Opulent and sophisticated. I agree Chloris, these colors could make a rich looking garden. I have a few things left over from previous attempts but will keep trying. Haven’t heard that saying before Cathy, but looked it up and apparently everyone else in the world is familiar with it. New hellebores continue to bloom and it seemed a shame not to include them, even though they’ve had their moment already. 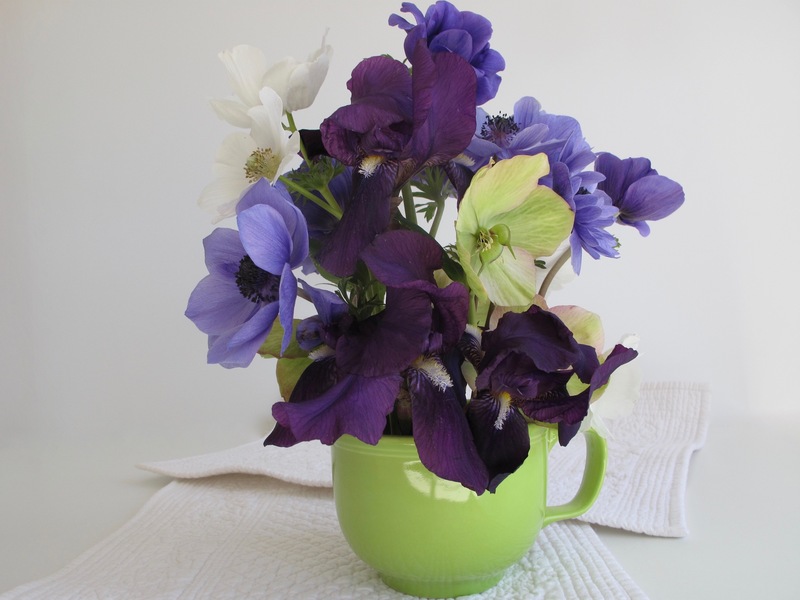 My favorite half of the color wheel too Susie….incredible purples and violets against that green cup! I love these colors so much I even have them in my house, and on the outside too….my front door is purple and my shutters are dark green! Good for you Donna. Don’t know if I could get the ARB to go along with those house colors but I bet they look great. Using the flowers together as we’ve both done today really does give strength to the arrangement; I love these colours together, I haven’t used my A, con. Mr Fokker enough in my vases and now he’s nearly finished. Your close up images of the individual flowers are beautifully clear and the colours look absolutely true. The light was pretty good when I photographed the flowers yesterday. Sometimes those colors are difficult to capture. You have so many other choices from among the flowers you’re growing but I’ve had to rely on the anemones (but I adore them so that’s fine). Too bad they’re wrapping up for the season–I’m hoping to get a few more weeks from these. None of my new ones planted last fall made it. Thanks Beverly. This spring has been kind to the flowers for the most part, although getting hotter today. Thanks Sam. Hope you’ll report how your anemones get along. I’ve planted them many times and the only ones that survived were planted in the fall. However, the ones plated this past fall did not survive. I find them very temperamental getting established. I think something (possibly a badger) has been digging up the corms so I’ll let you know if any come up! It’s a beautiful color combination, Susie! I’m impressed as always by the anemones – it appears that my chances of getting any more than the 3 tiny blooms I discovered weeks ago are nil as summer-like temperatures are already making an appearance. 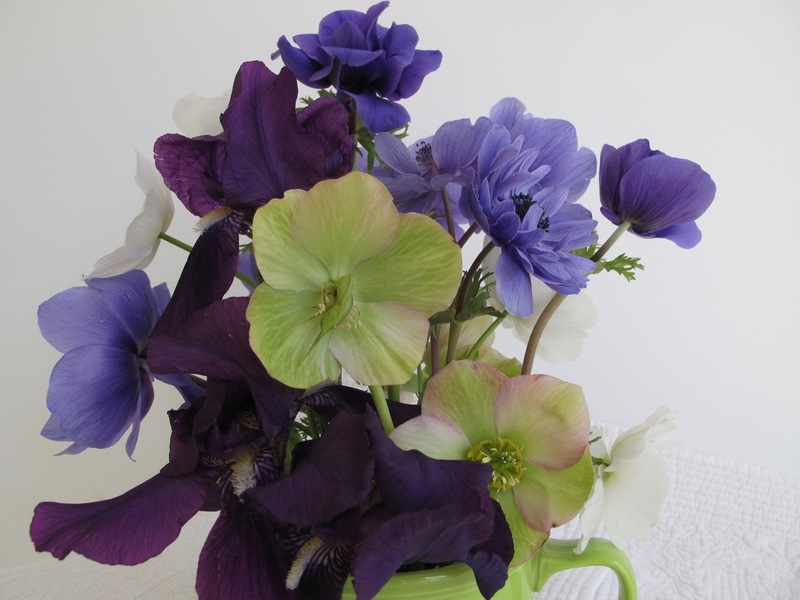 However, I do hope I can emulate your green-blue combination with some Eustoma (Lisianthus) later in the season. I managed to get a good supply of Eustoma plugs by mail order, including a never-before-seen (by me) green form. The green Eustoma sounds like a winner. Wonder if I could grow it here (in any color but especially like the sound of blues and greens). The green of the cup is a color that lifts other colors above the ordinary. I use Euphorbia blooms that way often. Oh, yes… a quilt would be brilliant…or a summer frock. Originally I’d planned to use a black tea canister. The green is more effective. I like to use euphorbia too. Nice, but the Anemone coronaria is my favorite. Jason, I can’t get enough of the anemones this year, but we’ve had mid-80s the past two days and they are looking upset about it. Oooo, I just love the dark purples, light purples, and light green together, what a winning combination. Hellebores just keep on getting more interesting as they age. 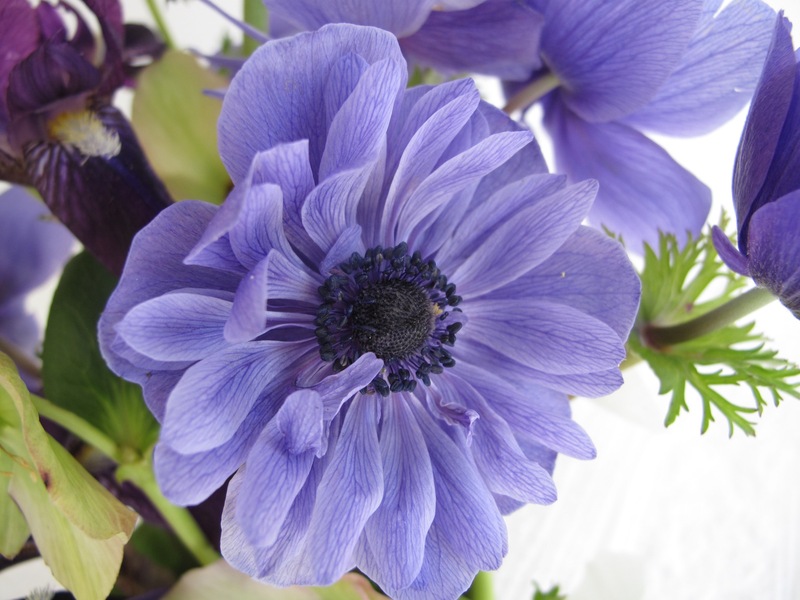 I just planted a mixed box of Anemone so hope I get some flowers in some of the lovely colors I see on IaVoM. Glad you like these colors too Hannah. Hope your anemone grow well for you. It became very hot here the last two days, mid-80s F., and the anemones looks very stressed. Really beautiful! For a second, without reading the caption, I thought the white flower is a poppy. I think A. coronaria is known as poppy anemone.